It is spring, isn’t it? It looks like spring. The grass is a vibrant shade of green, the trees are budding and the flowers are blooming. Friday didn’t feel like spring, though. There was a chill in the air here in Springfield, Ill. The day did not offer a temperature higher than 44, and the blustery wind pushed winter back into our thoughts. There were snowflakes in the air. Light flurries, even. Springtime typically means crazy weather here. One day, it will be in the 50s and cloudy; the next, it’s in the 80s with a tornado watch. Frankly, I don’t mind the weather being a little cooler, but gusts of cold air and snowflakes are a bit much for this time of year. We had 18.5 inches of snow in the last week of March, and according to the calendar, it was spring. The weather got me thinking about “spring on ice.” Pretty, fresh flowers covered in frost. A colorful world covered by winter’s white cloak. I pulled out my white cardstock and glitter to craft an all-white spring card. Almost all white. I added a touch of color with the sentiment. 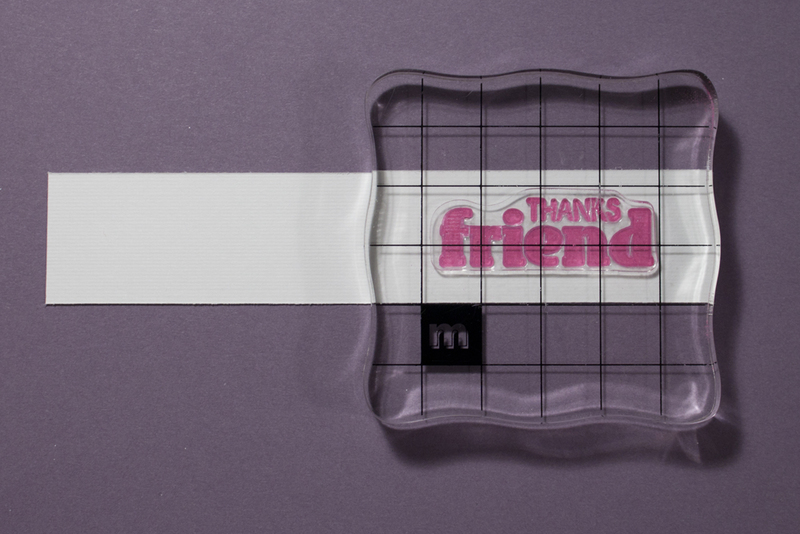 I also used a lot of dimensional adhesive to separate the monotone layers. 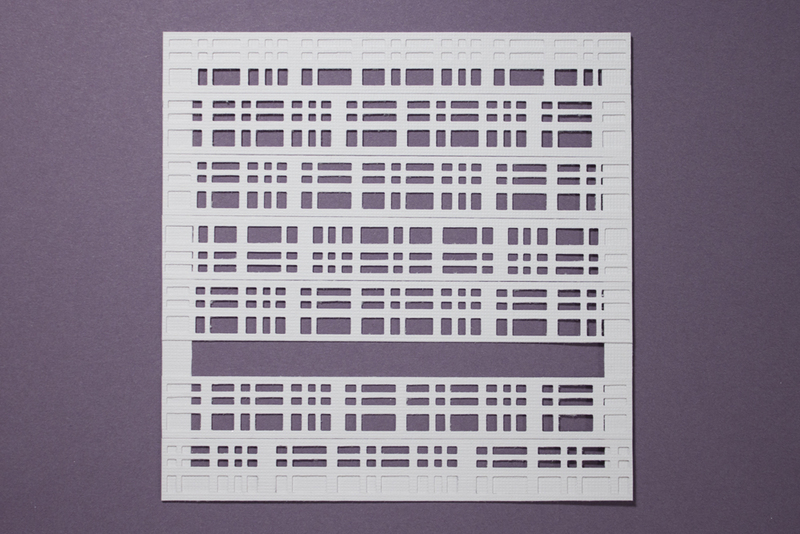 Make a card from a 5-by-10-inch piece of white textured cardstock. 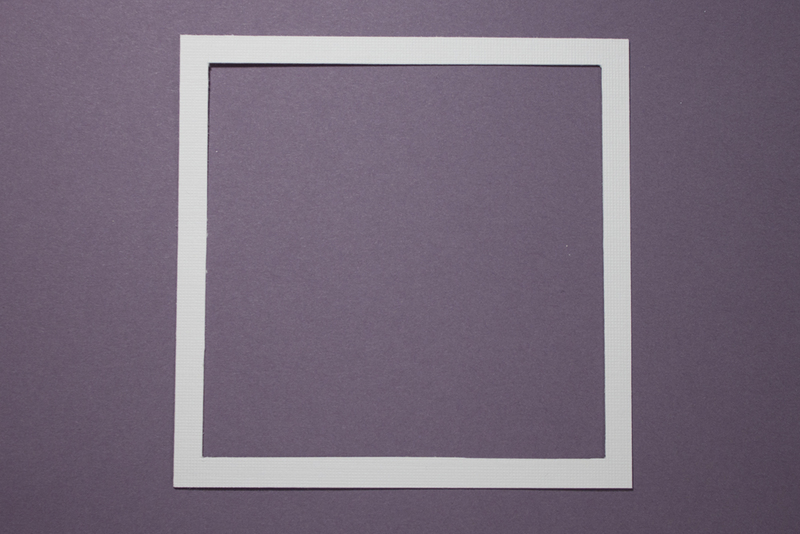 Cut a 4 1/2-inch-square piece of white textured cardstock and cut a 4-inch square out of its center, leaving a 1/4-inch frame. Punch seven strips of white cardstock with a plaid-patterned border punch (I used an EK Success Paper Shaper punch), with each strip at least 4 1/2 inches wide. Trim each strip’s top edge close to the punched border (this made mine about 5/8 of an inch high). Adhere a strip (I used Sakura Quickie Glue pinpoint roller) horizontally to the bottom of the frame, lining it up with the frame’s bottom edge. Adhere a second strip next to the first. Adhere a strip to the top of the frame, lining it up with the frame’s top edge. Adhere four more strips below that, next to each other. This will leave a gap, which is OK. Trim the excess from the edges. 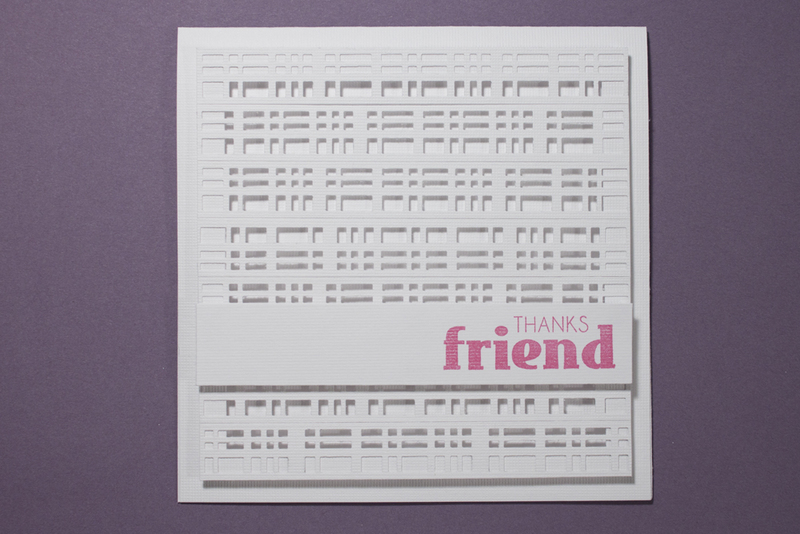 Stamp a “THANKS friend” sentiment (mine’s by Lynette Anderson Taylor for Studio G by Hampton Art) in fuchsia ink (I used Fresk Ink in fuchsia) onto a piece of white cardstock (I used the reverse side of a piece of white textured cardstock). Trim this piece to 4 1/2 by 7/8 inches, leaving the sentiment close to the right edge. Using dimensional adhesive, adhere the frame, centered, to the card’s front, and adhere the sentiment over the gap, lining up the left and right edges with the frame. Cover a white paper flower (I used a Bazzill Basics paper flower in gerber) in glue (such as Aleene’s Jewel-It) and in fine, white glitter (mine’s from Treehouse Studios). 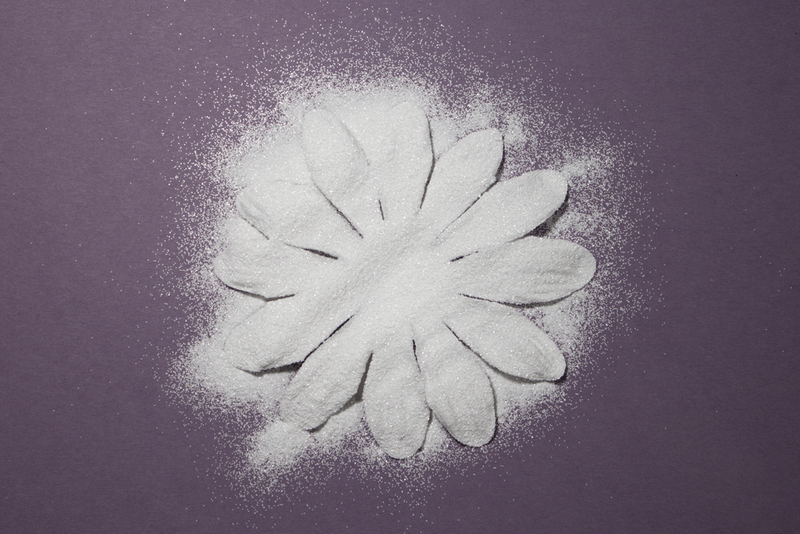 Shake off the excess glitter and allow it to dry, then insert a pearl-like brad through the flower’s center. Adhere the flower to the upper-left portion of the card, with its petals going over the edges of the frame. This entry was posted in Spring and tagged glitter. Bookmark the permalink.